Is this the fourth dimension of watching sports? 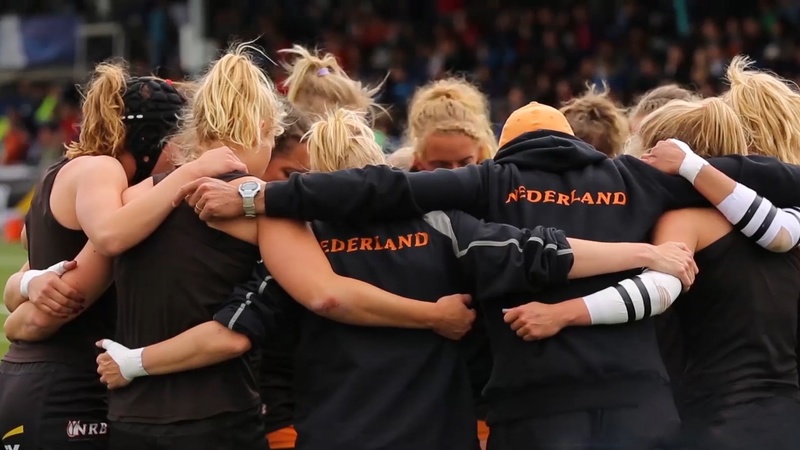 We dare anyone who says women's sport isn't exciting enough to don an NL Fan Jersey and watch a game of the Dutch Ladies Rugby 7's. The Fan Jersey is a custom version of Wearable Experiments' Alert Shirt, a piece of connected smart clothing created in 2014 to connect spectators to what is happening on the pitch, track or court. Smart sportswear worn by the Dutch team measures metrics like heart rate, impact and exhaustion then sends this to the Fan Jerseys in real time as haptic vibration patterns over the chest. So when a player smashes her shoulder into the ground, you'll feel the impact. It's all connected via a smartphone app and Bluetooth and the overall aim is to enhance the live action for the fans. Billie Whitehouse, co-founder and design director of Wearable Experiments (We:eX), said: "We're trying to capture the emotional aspects of adrenaline, heart beat, exhaustion and impact. We're physically writing a song on the body. This is the emotions played out on the chest of the Fan Jersey." We:eX has previously used haptic vibration motors in its stylish Navigate jacket, which allows wearers to find their way around cities via taps on the shoulder rather than smartphone screens, and its prototype Fundawear for Durex which lets long distance couples control shall we say, sensors in sensitive places. Back in April, Whitehouse told Wareable that the Alert shirt could be used both by fans eager for an extra dimension to sports entertainment and also those who want to make sure they don't miss the highlights while chatting and drinking in the pub. "For me, it's always been about getting our eyes back," she said. "Being totally dominated by screens does distract you. Obviously we're not ready to completely step away from this yet and that's why everything we have still has a smartphone application. "But we're moving away from it. The skin is a fantastic organ and so sensitive to communication." In sports, the Spanish startup First V1sion - an Intel Make It Wearable finalist - is also trying to bring fans closer to the action with a wearable camera that streams the athletes' point of view. It has already been piloted by Cordoba football club and one of its first big clients is the Turkish Airlines Euroleague basketball tournament. The Fan Jersey was designed in collaboration with Q & A Research, which is interested in the future of retail, and the Dutch Ladies 7s' sponsor Ernst & Young. With the trial taking place at an Olympics qualifier as Rugby 7s will debut at the 2016 Summer Olympics, Whitehouse and co are right on time.